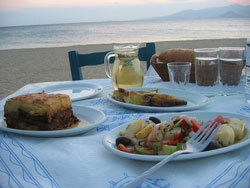 On Naxos you will experience the true meaning of hospitality. Most professionals in this line of business are locals, they love what they do and try, with the means they posses to make your vacation a wonderful experience. No matter what time of year you visit Naxos it is sure to enchant you. If you have the opportunity to take your vacation during the low season (October-May), you are sure to have a paradise-like experience. In the area of gastronomy and entertainment, there is an exceptional relationship between quality and quantity. Many a times you will be surprised by the generous portions served at restaurants. Prices do not include tips, which, only if you feel completely satisfied, and without it being mandatory, are approximately 10% of the bill. These establishments offer well know aromatic coffees of every kind, delicious breakfasts, beers, snacks, ice creams, waffles, crapes, sorbets, and milkshakes are also served. At sunset this is where you can enjoy your cocktail, perhaps the firs drink of the evening. Coffee prices range from 1.50 – 1.75 € (Greek coffee), 2 – 2.50 € (Nes Café/ice coffee and espresso), 2.50 – 3.00 € (cappuccino, freddo). At the island’s pastry shops you will taste marvelous local products and treats, but also more modern delights. There are about 10 different pastry workshops that supply Naxos stores as well as surrounding islands with scrumptious sweets. Even on the most remote beach on Naxos, the highest peak, or the smallest village, you will find some picturesque taverna. At these locations you might not be offered extensive menus, but you will wit out a doubt sample fresh, local products, most of which family grown. In the more central parts (Hora, Agios Prokopios, Agia Anna) your choices for food are numerous. Aside from traditional tavernas, restaurants with traditional Greek finger food (mezedopolia), fish taverns, ouzeries, and restaurants specializing in traditional Greek and local cuisine, you will also find Italian cuisine, German and Asian as well as Mexican cuisine. Most establishments charge a cover (0. 30 – 0.60 €) that takes care of the servings, napkins, toothpicks and many times bread. Prices can be characterized as varying from low to reasonable. When night falls you certainly will not be able to resist the temptation of a fun filled evening at one of the dozens of night establishments located in Naxos’ Hora. On the coastal main street, as well as its intricate alleyways, you will discover many tasteful bars that satisfy all music preferences. At many bars a reduced price is offered from 9 till 11pm (happy hour). Later on the larger clubs are sure to offer you thrilling entertainment. An entrance fee of 5 – 7 € is charged (depending on the season), which includes your first drink. The drinks served here are generous as far as alcohol proportions go (4 cl and many times 5-6 cl, in contrast to the rest of Europe where only 2 cl are poured). The staff consists of well-trained, experienced professionals with creative abilities. These nightclubs usually close down at dawn. 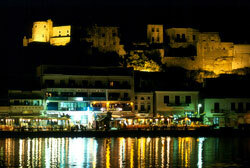 For a more atmospheric night you can choose one of the Agia Anna and Agios Prokopios bars. 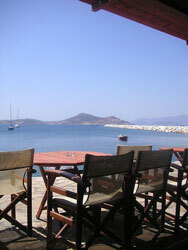 Bars are also found in the villages of Apeiranthos and Filoti, some of Naxos’ mountain villages!